Order must be place at least 48 hours before delivery date. Cut off time for order received is 10 am local time. Order received after 10 am will be delivered on the next day. Our shipping charge is $6 nationwide. 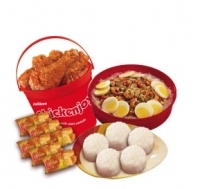 Jollibee Food item can possible to delivery within Metro Manila. However, we can deliver food item to nearby provinces to manila if your order over $149.